Our immune system protects us; however an overactive immune system can lead to self destruction and result in autoimmune diseases. Type 1 diabetes, arthritis and lupus all fall into this category and affect the lives of many people. In the department of pharmaceutics, the focus of Sihong Song’s research is to develop effective and safe therapies to help people suffering with these diseases. Using protein and gene therapy approaches, Song’s group discovered that a human protein, named Alpha-1 antitrypsin (AAT) could protect against diabetes development in animal models. These findings have led the field in reevaluating the functions and applications of AAT. Recent work done by Song’s group also indicates that AAT therapy may also be used for the treatment of arthritis and lupus. It is Song’s hope that one day AAT therapy can improve the lives of people with these diseases. In order to achieve safe, effective, and long-term therapeutic effect of AAT, Song’s research has focused on the improvement of AAT gene delivery systems. His work has probed into various basic molecular biology and immunology areas including optimizing promoters, vectors for muscle and liver gene delivery, understanding the molecular fate of vector DNA in the host cells, as well as immune responses to the vector and the transgene products. His research group has used adult stem cells as a platform and developed a novel cell therapy of AAT. Song is currently leading the group to genetically modify adult stem cells for gene corrections. 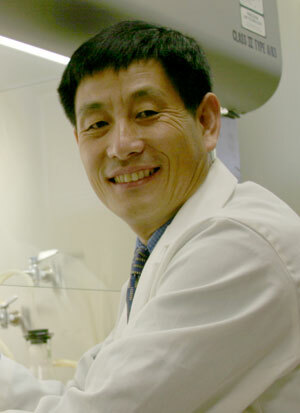 While using AAT as a therapeutic drug, Song has looked into the molecular and cellular actions of AAT. His group has discovered several novel functions of AAT including anti-cell-killing activity, anti-apoptosis activity, and inhibition of inflammatory cytokine productions. Song believes that these functions could potentially lead to the use of AAT in the treatment of many other diseases.